Can Barcelona keep the Champions League on Spanish soil? Spain rules football. If you disagree, where have you been for the past decade? La Roja bookended the 2010 World Cup by winning the Euros in 2008 and 2012. Vicente del Bosques' charges lost their way in Brazil but La Liga still holds the sceptre in the club game. 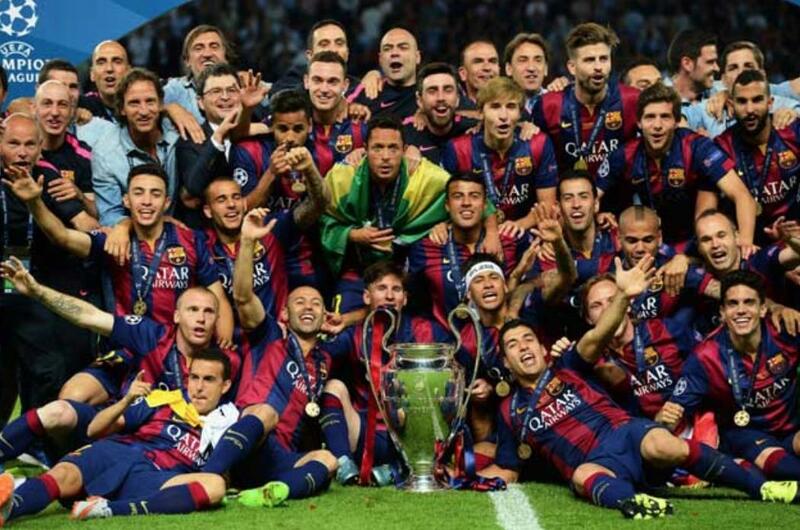 Spanish sides won seven from the last ten Champions Leagues [Barcelona 2009,11,15, Real Madrid 2014,16,17,18]. In addition, Atletico Madrid lost two finals in that stretch, one each to Barca and Real, but won three Europa Leagues [2010,12,18]. Los Colchoneros defeated Athletic Bilbao in 2102. As an Arsenal fan can tell you, Sevilla won three in succession under Unai Emery between 2014 and 2016. If you want to nitpick, you can say the current era of Spanish dominance began in 1998, when Real Madrid woke from a 32-year slumber to win the Champions League. Barcelona was the last Spanish team to be crowned European Champions in 1992. The Blaugrana were then battered by Milan, 4-0, in 1994. Since the Merengue's '98 awakening, however, Spain has not gone more than a year without hoisting one of Europe's top two trophies. Real followed up that title with another two years later and a third two years after that. The middle triumph came at Valencia's expense. Argentine Hector Cuper was their manager. The next season, Los Che made the final again, falling short against Bayern Munich. It was Rafa Benitez's first experience in a European final albeit far from his last. While the Galacticos were winning the Champions League the next season, Rafa and Valencia claimed the UEFA Cup, although it shouldn't be forgotten that Deportivo Alaves gave Benitez's future club, Liverpool, all it could handle in the tournament in 2001. The Babazorros finally succumbed 5-4 on a golden goal 26 minutes into added time. While Rafa went on to Champions League glory on Merseyside, Sevilla furthered the Spanish cause with two UEFA Cups in 2005 and 2006, the second an all-Spanish affair against the other club in Barcelona, Espanyol. The Parakeets employed a veteran Argentine centre-half on loan from Bordeaux. His name was Mauricio Pochettino. When you add it all up, Spanish clubs made finals appearances 27 times in the 21-year span between 1998 and today, winning 19 titles or 71%. England is the only other nation to reach double digits, making 16 finals, winning six. La Liga's dominance peaked over the last five years when Real, Barca, Sevilla and Atleti claimed nine of the ten crowns to be won. Jose Mourinho's Manchester United prevented a perfect ten with their 2017 Europa League triumph. However, no kings rule forever. Real Madrid allowed Zinedine Zidane and Cristiano Ronaldo to walk away, leaving its third consecutive defence of the Champions League in tatters. Meanwhile, Atleti felt Ronaldo's wrath in the second leg of their Round of 16 clash with Juventus, losing 3-0 when the Portuguese notched his fourth hat trick in eight matches against the Rojiblancos. Manager Diego Simeone will reconsider before pretending to juggle his balls a second time in front of the five-time Ballon d'Or winner. With the capital clubs falling, Barcelona is the sole surviving Spanish club in the Champions League. Valencia and Villarreal carry the Rojigualda in the Europa League but face each other in the quarterfinals. "The Champions League? It is a four-way race between Barcelona, Liverpool, Juve and City. The Barca team which beat us in 2015 seems stronger than the current one"
Well, who are you taking? The Catalans face a daunting task to keep the Champions League crown on Spanish soil. Inconsistency haunts them since last winning in 2015. A 4-0 loss to Paris Saint-Germain preceded La Remontada but the monumental comeback was frittered away in the next round against Juventus. Last season, they journeyed to the Eternal City with a 4-1 advantage over Roma. I Giallorossi humbled them 3-0 at Stadio Olimpico to advance to the semifinal on goal difference. Barcelona must hold their nerve for the duration to hoist the big-eared trophy. In the quarterfinal, the club who intruded on Spain's hegemony in 2017, Manchester United, await. On paper, Lionel Messi and company win handily. On the pitch, United's pacy wingers and quick counterattacks are elements that trouble the Cules. The Red Devils stunned PSG with a remontada of their own. They can't be dismissed. Because the draws for the quarter and semifinals were held together, Barcelona knows it will face the winner between Liverpool and Porto, assuming they defeat United. After the lesson in Rome, Valverde's side can't take anyone for granted but Porto would be the more desirable opponent. The Reds strengthened following their run to the final last term. Fabinho, Naby Keita, Xherdan Shaqiri, but especially goalkeeper Alisson Becker make the Merseysiders a dangerous foe. Arturo Vidal's signing was made with just such a squad in mind. From Juventus, Manchester City, Tottenham and Ajax, the Old Lady and Sky Blues are touted for the final. Connections can be made to all four. A long-awaited Messi/Ronaldo battle of the Ballon d'Ors beckons if the Bianconeri win through. If it's the Cityzens, former boss Pep Guardiola brings his quadruple-chasing squad cast in Barcelona's image. Is it better than the original? Spurs are managed by Espanyol legend Pochettino. Ajax gave Barcelona the departed Johan Cruijff, of course, but currently field Frenkie de Jong, already promised to the Nou Camp for 2019/20 and Matthijs de Ligt, strongly rumoured to be coming as well. Of the four possibilities, who wouldn't want to see a showdown between Ronaldo and Messi to once and for all settle the debate over which is the greatest? The only thing that would make it better is if UEFA arranged for Diego Simeone and his juggling balls to be the special guest referee. Kenzy Muller- A 20yrs old diehard Arsenal fan. Patiently waiting to see Arsenal at the zenith of European football. I love and enjoy writing, watching, reading and kicking a football. Who will be Ajax's next 'next generation'? Can Ajax and Barca's renewed love affair survive a honeymoon in Madrid?